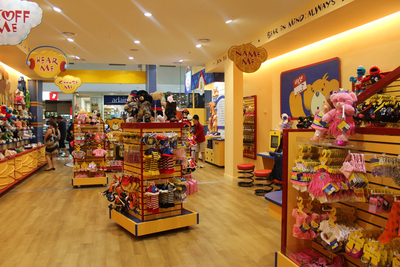 Build-a-Bear Workshop already have many successful stores around Australia and the rest of the world, but their Westfield Marion store is Adelaide's first. The store is down near the Kmart end of the centre, on the second floor. 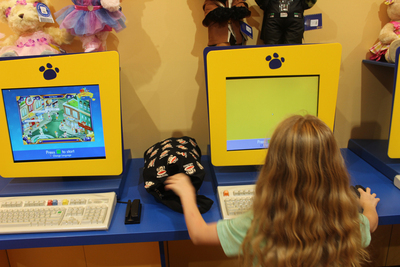 Build-a-Bear is no regular toy shop, where you pick your toy and head straight to the counter. 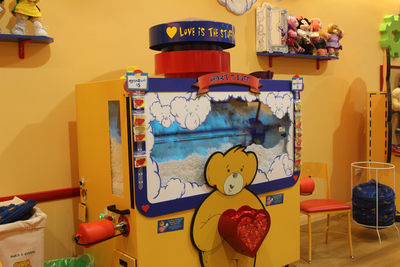 2 parts love and one part clever marketing, at Build-a-Bear kids are involved in every part of bringing their new furry friend to life. It all starts at the toy wall. There are teddy bears, sock monkeys, cartoon characters, dinosaurs and plenty more to choose from. 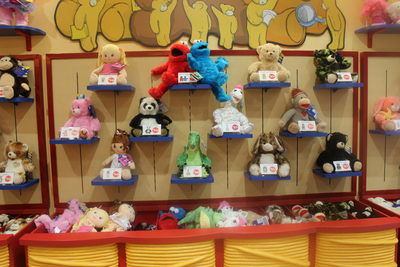 The finished toys sit on the wall, and you can choose from the unstuffed toys below. There are more traditional bears and other animals, or brighter more colourful bears. You can add sounds to your bear that range from songs, animal noises, or sayings. If the bear is a special gift for someone you can even record your own message to put inside. The next step is stuffing the bear. There's a huge machine full of whizzing stuffing that looks a little bit like magic clouds being swirled around. 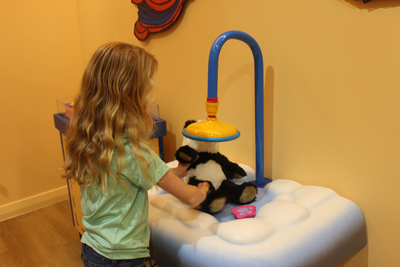 A store helper will fill your bear while you press down on the foot pedal to make the stuffing come out. 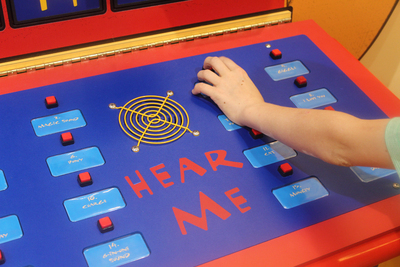 The store helpers are great, and they really help bring the magic of the store to life with their tales. Before the bear is sewn up, there are a few other extras you can put inside. Every bear needs a heart, and there's a bit of a ritual required to help bring the heart to life. Children rub the heard between their hands to wake it up. Then they have to rub in on their heart to give it lots of love, rub it on their nose to make it nosey, rub it on their forehead to make it smart, and rub it on their ears to make it a good listener. Then they make a special wish before it's slipped inside. 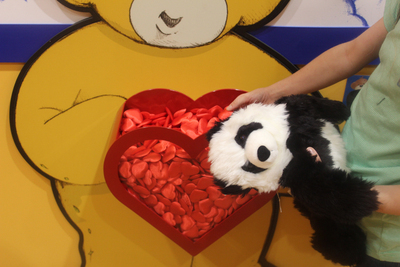 This heart is free for every bear or toy. One of the best additions is the heartbeat. 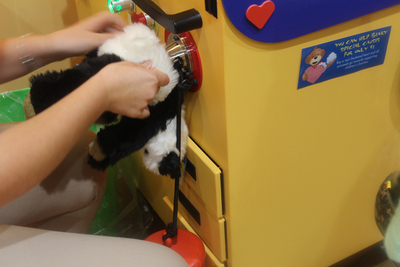 The little heart shaped contraption is placed inside the bear, and when it's pressed you'll feel the babom of the teddy's heartbeat. It's very sweet. There are smells too, which can make your teddy smell like fairy floss or strawberries. 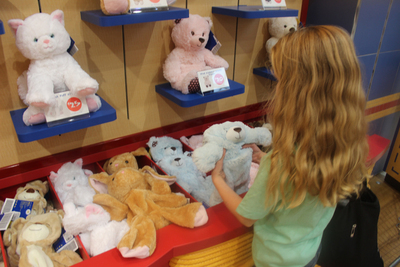 Before heading over to the clothes and accessories, you take your bear over to the fluffing station so that it's as soft and cuddly as can be. The staff will encourage you to spend, spend, spend, and so will your kids. The simple bears are generally around $25-$30, but there are plenty of extras and accessories that will bring this total amount up. It's good to work out a maximum spend so you don't get caught unawares. Once you've finished it's time to name your new friend and get his certificate printed out. Each bear comes with it's own little cardboard house to carry them home in, and once you've paid you're good to go. Toys from the Build-a-Bear workshop make a very special present. 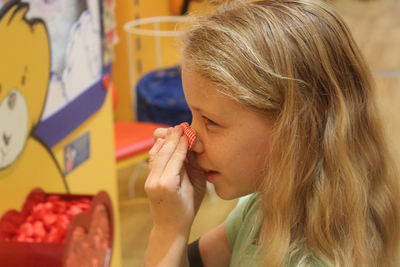 It might not be the shop you go to for a small treat, but for a gift that's full of love there aren't many better toy stores.